pet consume the pure, fresh, health-promoting omega-3s you and your pet companions need. Nordic Naturals guarantees exceptional quality (purity and freshness) fish oils by surpassing the stringent standards set forth by the Norwegian Medicinal Standards (NMS), European Pharmacopoeia Standards (EPS), Council for Responsible Nutrition (CRN), and World Health Organization (WHO). 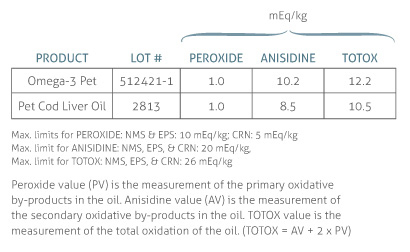 These quality standards set maximum allowances for oil oxidation (peroxide, anisidine, and totox) and environmental impurities (heavy metals, PCBs, dioxins, and furans), delivering pure, fresh, health-promoting oils for you and your pet. Nordic Naturals fish oils are distilled for purity, using the latest distillation technology, to effectively remove potentially harmful environmental toxins. All of our oils are third-party tested by independent laboratories to verify the removal of heavy metals and over 210 environmental contaminants. Analysis is based on the toxicity equivalent methodology established by the WHO. Nordic Naturals fish oils are guaranteed to have no detectable levels of lead, mercury, dioxins, or PCBs in accordance with the limits set by the Norwegian Medicinal Standards (NMS), European Pharmacopoeia Standards (EPS), Council for Responsible Nutrition (CRN), and World Health Organization (WHO). Freshness, which ensures product integrity and biological efficacy, may be the single most important quality of fish oils. Omega-3 fatty acids are polyunsaturated fats, and are highly susceptible to oxidation. Oxidation occurs when oil absorbs oxygen from the environment, causing oil degradation and rancidity. nor healthy for you or your pet. Nordic Naturals uses only the best raw materials available: fish low on the food chain, which naturally contain low levels of impurities and are also ideal for long-term sustainability. All of our products are made from three fish species: Arctic Cod (Skrei), anchovies, and sardines, as they are naturally high in the omega-3 fatty acids EPA and DHA. Nordic Naturals ensures that 100% of all fish harvested are utilized for human or animal consumption. Excellence in oil taste requires excellence in oil freshness. Nordic Naturals’ patented manufacturing process achieves both, for you and your pet. Our carefully crafted Pet Cod Liver Oil and Omega-3 Pet products deliver a pure, fresh taste that pets savor down to the last drop. Even pets with the most discerning palates enjoy our oil—best appreciated as is, no flavorings are required. In nature, omega-3 fatty acids occur in the triglyceride form. However, some fish oil products on the market contain omega-3s that are produced in the synthetic ethyl ester form. 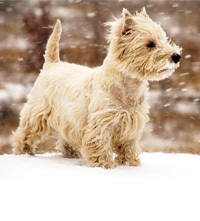 All Nordic Naturals products contain omega-3 fatty acids and are manufactured in the natural triglyceride form to ensure optimal absorption and utilization, delivering maximum benefits to you and your pet. Nordic Naturals is a research-driven company, where processing technology and product formulations are driven by the latest scientific developments. Our dedication to innovation is grounded in scientific research guaranteed by active participation in peer-reviewed clinical studies recognized by leading experts worldwide. With a reputation for efficacy and potency, Nordic Naturals fish oils are regularly chosen by independent research institutions and universities—such as Harvard University, Columbia University, The National Institutes of Health (NIH), Stanford University, Duke University, UCLA, and the Cedars-Sinai Medical Center—with 25 published studies, including 15 clinical studies, and more than 30 in progress. Nordic Naturals oils are third-party tested by NutraSource Diagnostics Laboratory in Canada to verify oil quality (purity and freshness levels). Fish oil structure, purity and freshness dictates, quality, function and efficacy. Choose a company that adheres to the stringent international standards set forth by the Norwegian Medicinal Standards and the European Pharmacopoeia for fish oil quality – purity and freshness. Fish oil should be distilled for purity, without use of chemicals, to effectively remove heavy metals, PCB’s, dioxins and furans while preserving the natural constituents of the oil to the highest degree. Request third party laboratory test results on the fish oil, from the manufacturer, to verify fish oil purity and freshness. There should be no detectable heavy metals, PCB’s, dioxins, furans and oxygen in the fish oil in accordance with the international standards for fish oil quality. Confirm the fish oil (omega-3 fatty acid) is in the natural triglyceride form. The natural triglyceride form is a more stable form, which ensures optimal freshness and utilization of the oil by the body. In nature, fish oil naturally occurs in the triglyceride form. However, fish oil can be converted to an unnatural and less stable form called an ethyl ester. Studies suggest that fatty acids in the ethyl ester form may not mimic the physiologic activity of the natural triglyceride form, and may not be absorbed and utilized as well as the more stable, natural triglyceride form. Fish oil should be processed in an oxygen free environment, which maintains oil freshness and integrity. Freshness in fish oils directly correlates to the taste and utilization of the fish oil by the body. Protect our oceans by using fish oil obtained only from sustainable wild fish.